Online Newspapers is a gateway offering a large amount of worldwide newspapers’ websites links, at a local, national and international level. The site is maintained by an Australian company providing internet search services, even though no clear information about its identity is provided here. 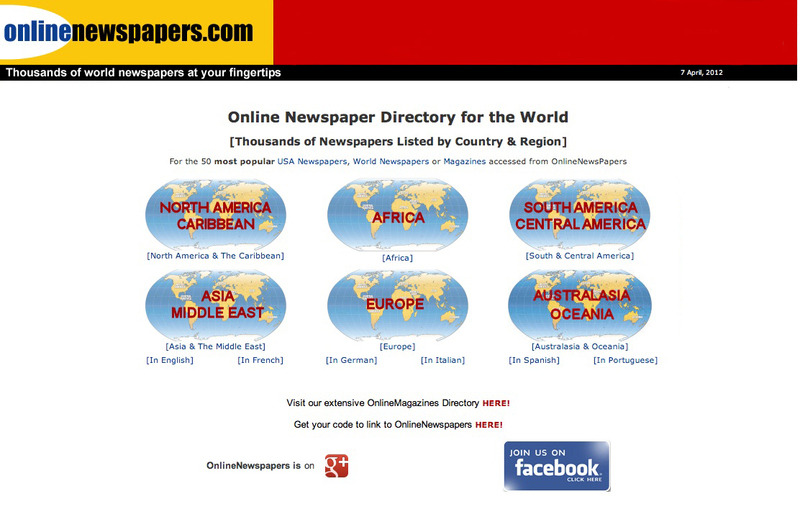 This website contains listings of almost any newspaper website worldwide, with direct links organized in a single page. It’s a very useful tool for researchers interested on the media and press, and for any user interested in following and retrieving updated news. Newspapers’ websites links are organized by geographical areas, although there is no direct access to newspaper articles, but only to their homepage. This website has a very clear structured and features some sections containing a series of link listings, reachable through a basic search engine interface on its homepage. Content is completely free; users can also have some degree of direct interaction: they can add new newspaper links, alert about errors or web address changes. Overall the website interface design is poorly developed, though, mainly limited to its search interface. Also, there is no specific information about the general updating rate.